There are three main types of small analogue recording tape, the microcassette, Philips minicassette and Grudig Stenocassette. These were commonly used for voice recordings and portable recording although due to their inherent low recording quality they don’t have a wide frequency response so can only feasibly sound acceptable for voice recordings. Microcassettes look very similar but are not compatible, with Philips minicassettes being slightly larger and not capstan driven. Grundig stenocassettes are very different again. Method one is quicker and cheaper giving good results. Method two will give the best possible quality as a high performing machine can now be used with better control over tape handling and azimuth but will take longer and cost more. We offer a range of delivery formats for audio transfer including Broadcast WAV (B-WAV) files on hard drive or optical media at 16 bit/44.1 KHz, 24 bit/96 KHz (the minimum recommended archival standard) and anything up to 24 bit / 192 Khz. Due to the technical limitations of the microcassette format and it’s portable design, recording quality may not be very high. These tapes are often good candidates for digital restoration. Using a selection of software tools in particular Izotope RX and Sonnox Restore, experience and a good acoustic environment we are able to improve the audibility of speech and reduce a wide range of noise types such as hiss, hums and buzzes that can destroy audibility and reduce listening pleasure. 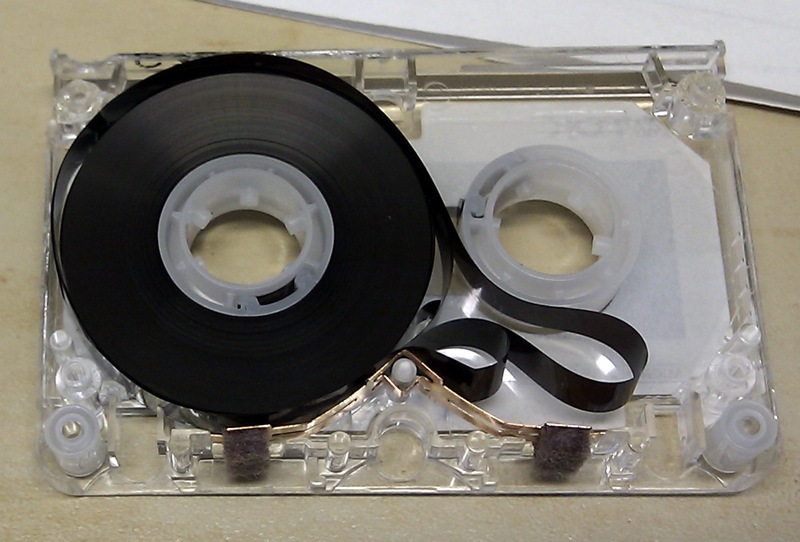 The tape in microcassettes can often snap, pull out from the end of one spool hub or become wrapped around a part of the player’s transport or ‘chewed’. We can repair these problems usually keeping the original shell and minimise any loss of the original recording. The microcassette format was developed by introduced in 1969 by Olympus. The tape width is the same as compact cassette but it’s case is much smaller. By using thinner tape and slower recording speeds recording time was comparable to compact cassette with the MC90 tape offering 45 minutes per side at 2.4 cm/s or 90 minutes per side at 1.2 cm/s. Due to the small tape size, flexible speeds and portable recorders, the microcassette format was popular as a recording medium for dictation and in answering machines usually used for voice recordings. The minicassette is a very slightly bigger format cassette used mostly in professional dictation machines as it’s capstan free design makes the transport simple, robust and suitable for repeated and quick forward and reverse winding. Playback speed is easy to alter for transcribing purposes but speed stability and wow and flutter are poor making it suitable only for voice recording.